So what have you been up to this past week or so? I’ve been taking a little break from work to play with an assortment of things. This is what’s up on my design wall today . . .
Aren’t these just the happiest prints? They are called OZ by Sanae. The pattern is named Hopscotch and it can be found in my Fat Quarter Five book. I’ve got lots of other piles around the studio and I’m just trying to decide what fabrics should go with which pattern . . .
It’s about a Harvard professor who is diagnosed with early onset Alzheimer’s disease. I was so tragic, yet so interesting that I couldn’t put it down. It’s definitely a must read for those who want to understand this disease better. It made for a good discussion and I will definitely be passing this one on for someone else to read. I’ve also been watching lots of TV lately, which I don’t normally do that much of. The reason is the Olympics. Last night the female ice skating competition wrapped up and the performances were stunning. All this TV watching has led to lots of knitting being done – This sweater is blocking, but I have to finish up the sleeves yet. I’ll tell you more about it as soon as it’s finished. It actually fits – and I didn’t even have to tear it apart to alter anything (like I usually do). The only thing I altered was making it a raglan sleeve, but that I did ahead of time and didn’t require any “tinking.” For those of you who are not knitters, that is knit spelled backwards. In the knitting world, taking something apart is also known as frogging. I guess knitters have more creative words for “tearing out” than the quilters do! 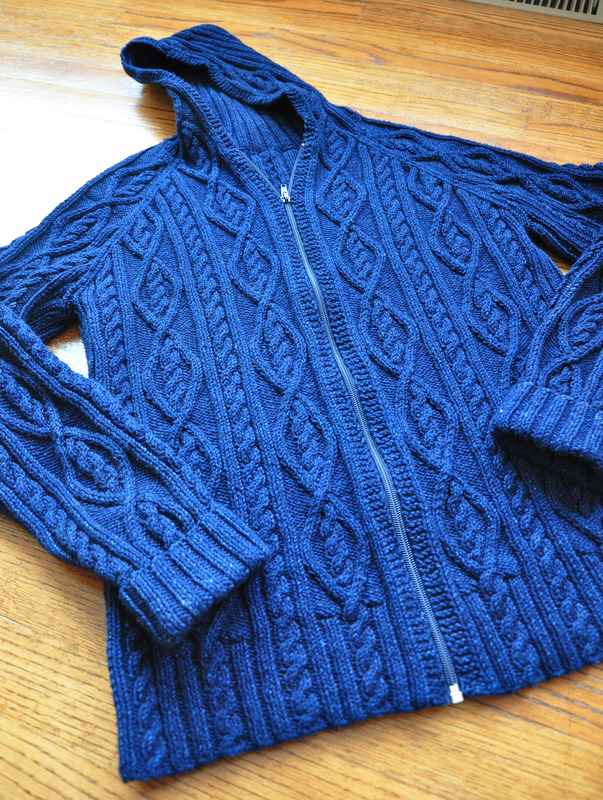 This entry was posted in Knitting, Quilting and tagged Debbie Bliss knitted cabled jacket, Sanae by Oz. Bookmark the permalink. I love both versions of the hopscotch quilt! What a simple, yet striking pattern. ♥ it! Wow, LOVE the sweater! That’s an awfully complicated pattern to do while enjoying something like the Olympics! I did some Olympics knitting too, but nothing as involved as that! Your cables are beautiful and the fit looks to be just right. I much prefer knitting raglan sleeves than set in sleeves too, maybe because the fit is a bit more forgiving? I don’t know. Love the color too…what’s not to love about denim? Nice job! your knitting is amazing. How long does it take to finish a sweater? Love it! Love the quilts and your knitting always looks like it was knit for the pattern books! You do such a great job! Wow, I wish I could knit! Beautiful! It looks so tough…someday I’ll try it. I love black in quilts… it adds just the right amount of zing! And wow, you are such a fast knitter. Amazing! PS – I finished two of the Kaleidoscope quilts from the Livin’ Large book… I posted them on my blog last week, if you would like to see how they turned out. 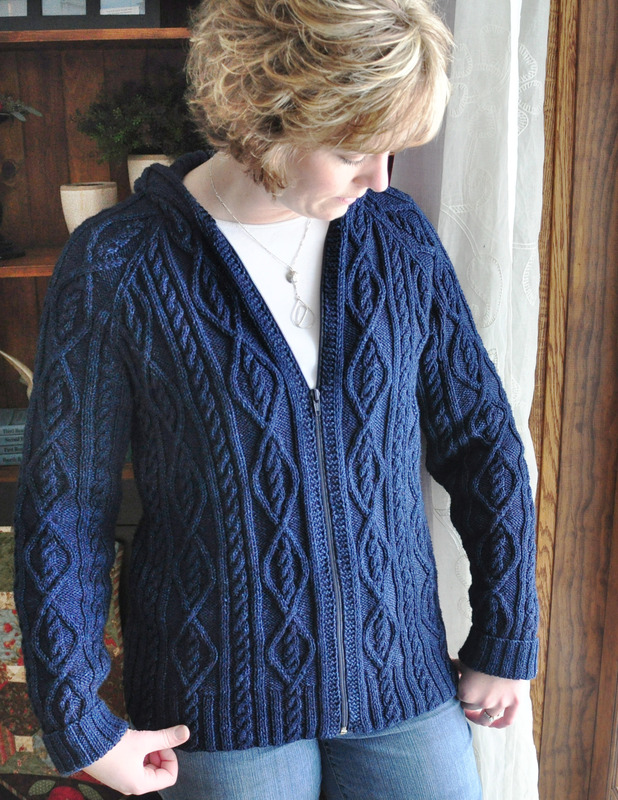 The quilt and sweater are both gorgeous! 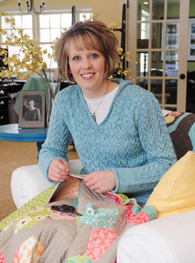 Gorgeous quilts and gorgeous knitting!! That hoodie is amazing. It fits you beautifully too. 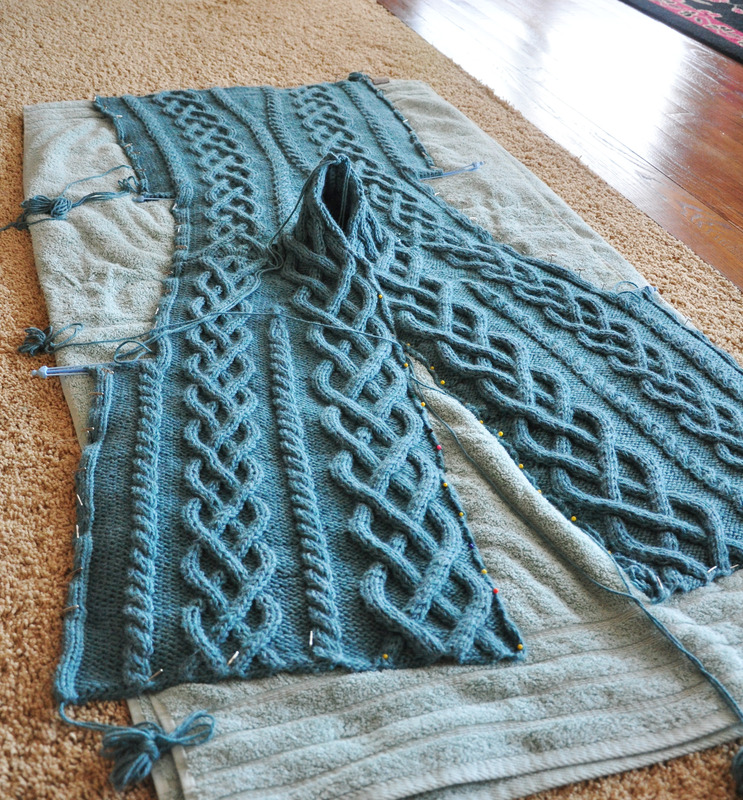 You have inspired me to be brave and try another cabled garment! We read that book in my book club as well. I am currently going to school full time, and have struggled to keep up with my book club picks. I recently discovered audio books, which a great alternative because I have to travel to get to school. Still Alice was my first audio book. LOVED it! I couldn’t wait to get into my car every morning to put it on. I guess that’s just like not being able to put a book down! I really liked the subject. It made me feel pretty blessed about the healthy life that I have! Beautiful quilt and knitting!!!! You are definitely keeping yourself busy. Love your knitting! I’ve only tried cabling once and kept having to rip. I think I need to give it another try now though. Still Alice is a wonderful book. I couldn’t put it down either and have recommended it to lots of friends. love the OZ quilt. It’s so bright and happy, even the gray fabric works! 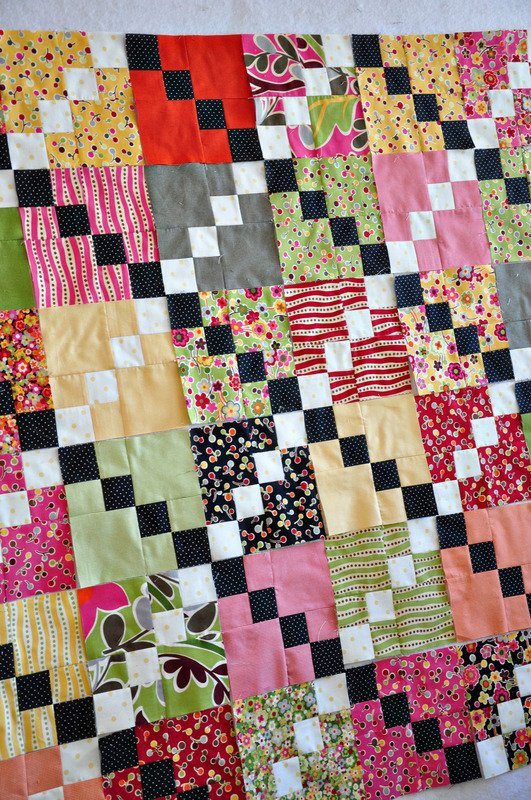 Love your quilts and patterns. You’re quite a good knitter too. Makes me want to start knitting again. Thanks for the inspiration. That quilt is just awesome! Love the contrast of fabric types and colors. Your sweater is beautiful. You are one talented lady. Wow, so much to see at once!! I agree with another comment, the black in the quilt adds so very much! Since I have been knitting, all the reading I used to do doesn’t happen anymore. I have been too absorbed in the Olympics to knit while watching though. BEAUTIFUL sweater! You are truly the queen of cables I do believe! I definitely am going to try to do more raglan sleeves and knitting in the round to avoid seams. 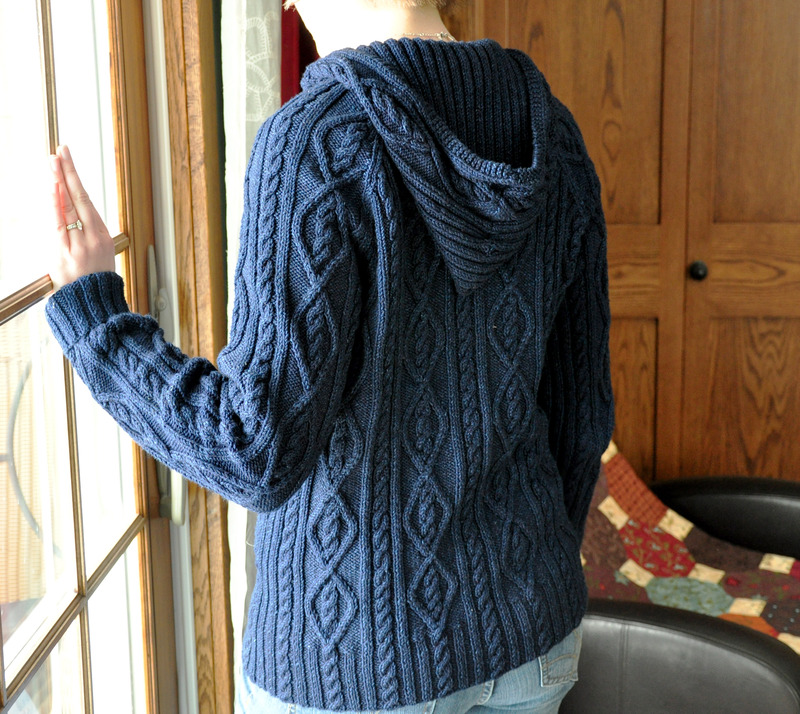 After putting Central Park Hoodie together this week, I have decided seaming isn’t my favorite thing to do. Beautiful sweater. I am always impressed with your knitting skills! All of that in one week? You must be superwoman!! Love the sweater. Which knitting method do you use? English or Continental? Do you think one is superior over the other? Thank you for the book recommendation. I’m usually in the crime/thriller fan but would not mind trying out new books. I too am stuck in front of the tv too much. The first half of the year, its the usual CSI,CSI NY, the European Champions League, and American Idol. But this year, not only the Winter Olympics but its the same year as the World Cup. Way too much tv and most of the live games will be in the early morning hours in Malaysia. I just bought Oz this week in a kit- and I never buy kits but it was just too cute. I too have piles of fabric waiting to be matched with patterns although I think I’ve committed Simple Abundance to the Hopscotch pattern. Great knitting too and perfect color and fit. 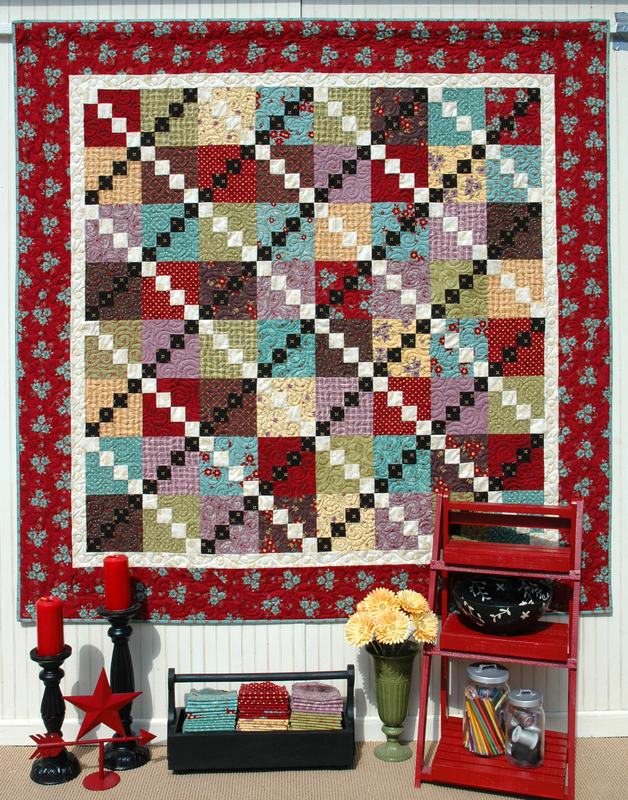 Love the quilt – those diagonal lines are great! 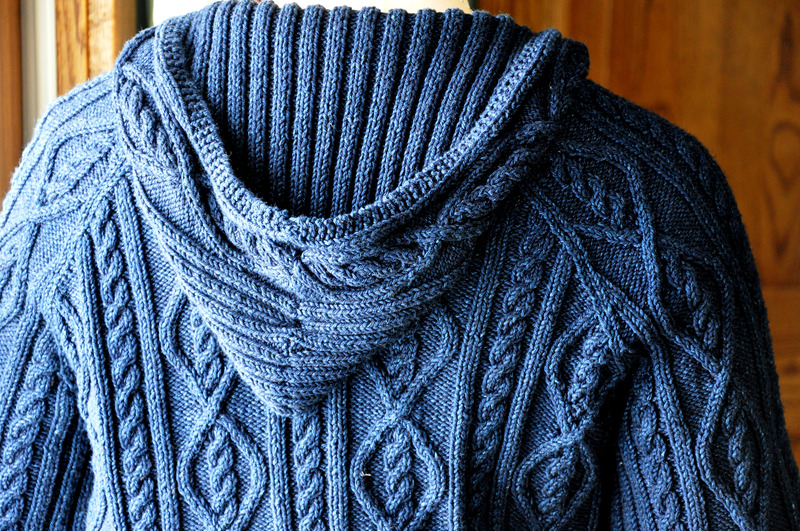 The sweater is terrific and fits you beautifully. Congrats! Wow, is all I can say too! I can’t even comprehend the knitted sweater, it’s gorgeous!! Love the quilt, too, but the sweater…! I love this quilt pattern…I saw it made up in a shop a couple years ago…which led me to start buying your books…but I’ve never actually made it…love it in Oz! And the knitting you’ve accomplished…beautiful! I love, love, love the hooded sweater!! It looks awesome on you Heather!! Your pattern looks great using Oz!! your quilt and your sweater are so pretty!! i have a hard time knitting sweaters in adult sizes, take too long, last one i did i ended up burning myself out and am now just trying to knit again. kinda sad, but it is true. great job!! Your knitting is stunning! 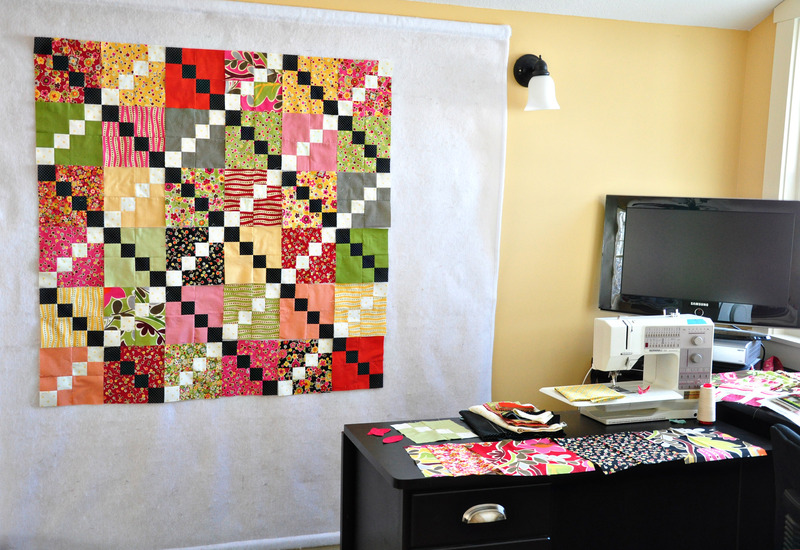 I also love both the fabrics used and the quilt pattern currently up on your design wall. Bad spelling and proofreading! It is Drape, not Draper! gorgeous sweater and it looks great on you!! Oohh, I am so jealous of your knitting abilities. I think I’m drooling! I also love the hopscotch quilt. I think it would be a perfect pattern for the pack of FQ’s I bought for my daughter. Love it! Love your sweater and the hopscotch quilt! Beautiful sweater. The color looks great on you. I am not a knitter so am always amazed when I see other items made by knitters. I use to feel that way about quilting so am glad I learned how to quilt. The hopscotch quilt looks great also. 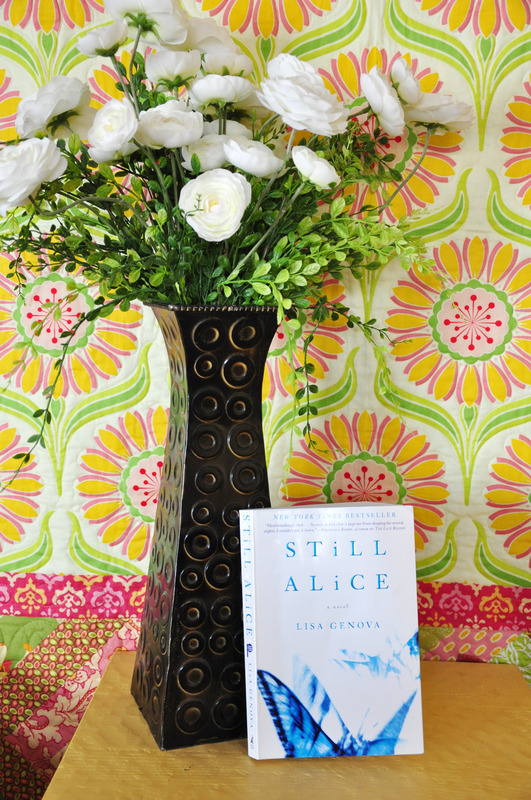 I absolutely loved “Still Alice” and having lived through that same situation within our family it was a tearful read. I too have shared this book with many many people! Heather, what a coincident – I have my Hopscotch folded and about 3 ft from my machine – I’ve been wanting to do it for so long – I have most of the original fabrics. I just wanted to finish up some hand applique that has also been pulling me in directions. 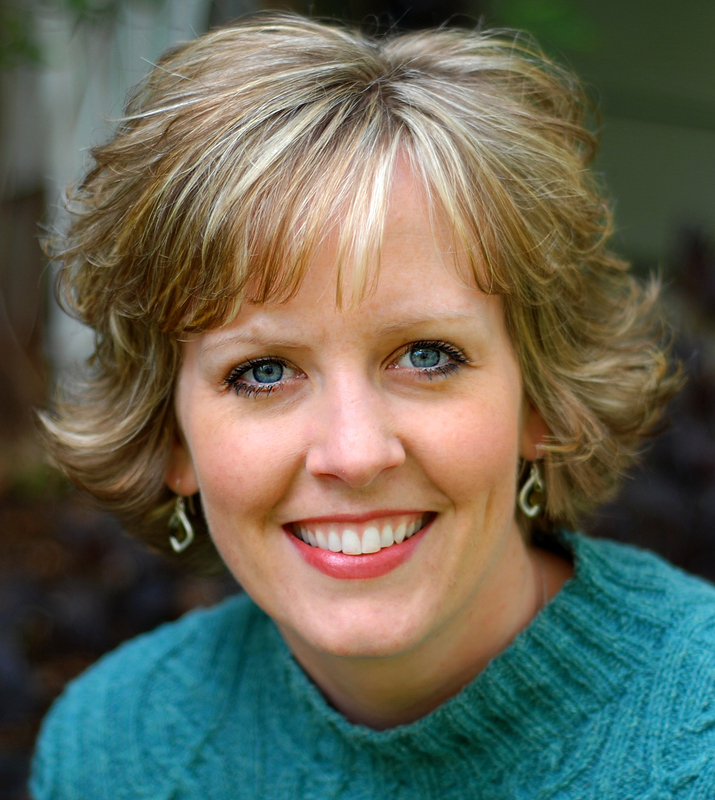 Your sweater is beautiful and so inspiring – I’ve told you, I am a knitter wanna-be!! Ahhhhh – the Olympics…. I am watching closing ceremonies now. Hoping I can get to bed by a decent hour soon. I am probably programmed to keep watching tv late into the wee hours!!! I have sooo enjoyed them – all countries!! And I have saved Still Alice for last – I will get this book, but have a lump in my throat right now. My dad had this disease and is now gone 4 yrs. I just met new neighbors down the street and the husband told me they moved back after learning his wife has Alzheimers. Thank you for the heads up on the book, I’ll look for it. Hugs! Loved reading your blog today. The quilt is awesome! Loved your finished hoodie sweater and also you yet to be finished sweater. Your cable work is amazing. I used to knit alot but lately since I got a longarm all I do is quilt, for myself and others. I really want to get back into knitting. I bought some skeins of yarn to make some socks. When my kids were small I used to knit them hooded sweatshirts and I would like to make on for my grandaughter. Thanks for the inspiration. I lvoe that sweater, wish I could knit. I am new to your site though and was wonering if you have a pattern or larger picture of that quilt shown in your photo of the book and vase. It looks really cool. thanks. Love love the sweater…you did a great job. And the chains are right up my alley.